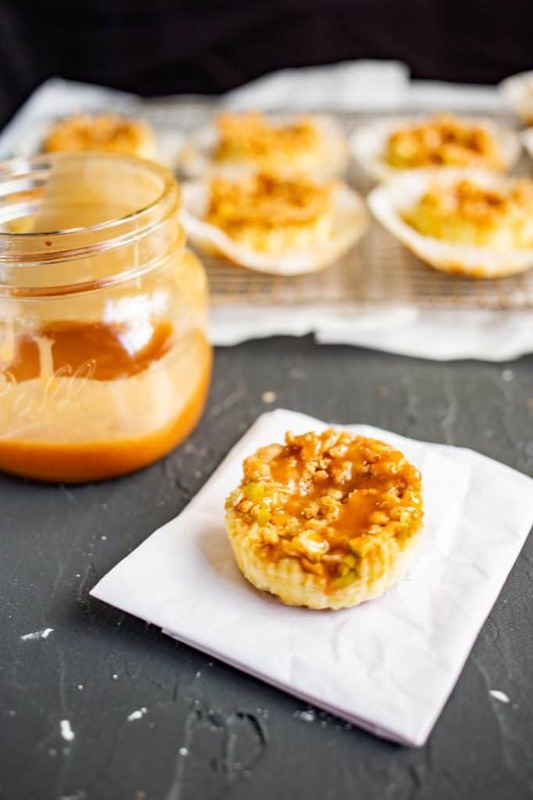 These mini caramel apple cheesecakes make the perfect, individually portioned fall dessert! When the calendar turns to September, I’m ready for fall to start. Even though the temperature in Nashville will still feel like summer for another month or two, I’m craving apples, pumpkins, and fall desserts. These salted caramel apple cheesecakes are the combination of three of my favorite fall desserts: caramel apples, apple crumble, and cheesecake. All portioned out in a muffin sized dessert. Start by preheating the oven, lining a muffin pan with cupcake liners, and prepping the “crust”. I like to use golden Oreos as the crust. Simply break them in half and put one half in each cupcake liner, pretty side down. If you don’t have any Oreos around, then substitute any similar sized crunchy cookie, like ginger snaps. Next make the cheesecake mixture by beating together cream cheese, sour cream, sugar, vanilla, and an egg. Divide the batter among the cupcake liners. My favorite way to portion out batter is to use a disposable frosting bag or a large Ziploc bag. Put the batter inside, cut off a small corner, and pipe the mixture into the cupcake liners in a swirl pattern. Prep the finely chopped apples by mixing them with cinnamon, sugar, and nutmeg. Sprinkle over the cheesecake mixture. 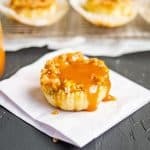 My favorite apple to use in desserts like this is Granny Smith – the tartness perfectly complements the sweetness of the caramel. Then prepare the crumble topping by mixing together the flour, sugar, and oats with a fork. Add in the butter. The mixture should be crumbly. Sprinkle it over the apples and bake the cheesecakes for 23-28 minutes. When the cheesecakes are done, allow them to cool for about 30 minutes at room temperature. Then prepare the caramel. Heat it in the microwave for about 30 seconds until it’s smooth and pourable but not too liquidy. Then put the caramel in a frosting bag or a large Ziploc bag. Cut off a small corner and drizzle over the cheesecakes. If you want to serve the cheesecakes without the cupcake liners, then gently take the liners off the sides now (don’t worry about taking them off completely yet, it will be easier after the cheesecakes have chilled). If you want to serve with the cupcake liners on, then skip this step. 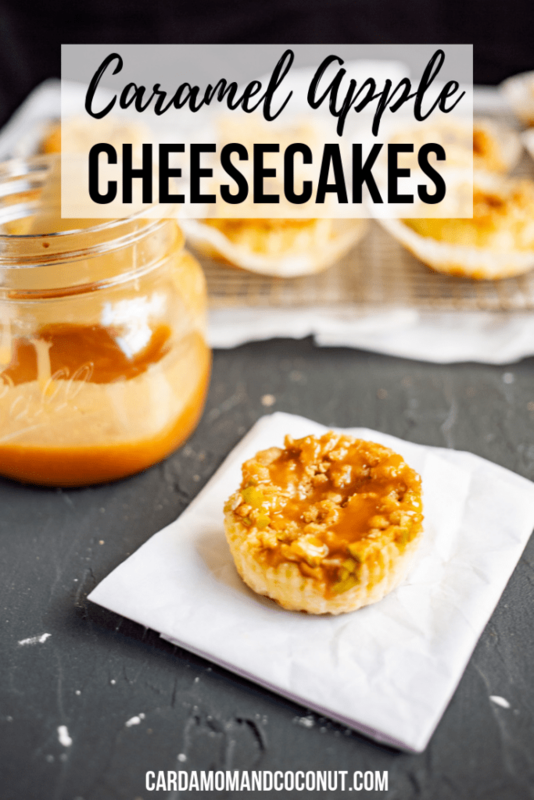 Drizzle the caramel on top of the cheesecakes. Then refrigerate for two hours and serve. I like using a nonstick muffin pan like this one. Since you use cupcake liners in this recipe, it doesn’t make much of a difference, but a nonstick pan is perfect for muffins, mini frittatas, and quiches. Disposable frosting bags make it really easy to portion out batter and neatly drizzle caramel. I use them so often. You can substitute large Ziploc bags in a pinch, but be careful not to apply too much pressure or the seams on the Ziploc bags may burst (I learned this the hard way after making a huge mess). 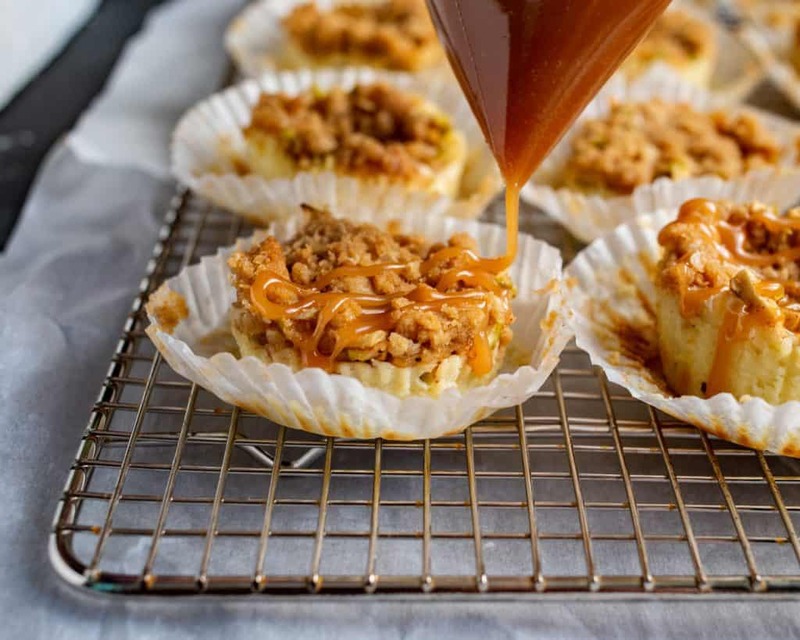 If you try this recipe for mini caramel apple cheesecakes, leave a comment and review below and let me know what you think! What are your favorite fall desserts? Preheat the oven to 350 degrees F. Line a 12 cup muffin pan with cupcake liners. Twist the golden Oreos in half and place one in each muffin cup, pretty side down. Make the cheesecake mixture by beating the cream cheese at medium-low speed until smooth and fluffy. Add the sour cream and continue beating until smooth. Then add the sugar and vanilla extract and mix well. Finally, beat in the egg. Evenly divide the cheesecake mixture among the Oreo crusts. My favorite way to do this is to put the mixture in a disposable frosting bag or a large Ziploc bag. Cut off one of the corners and pipe in the cheesecake mixture in a spiral pattern. Prepare the apples by mixing the finely chopped apples with cinnamon, nutmeg, and sugar in a medium bowl. Sprinkle the apples on top of the cheesecake mixture. To make the crumble topping, mix together the dry ingredients with a fork and then add the butter and mix well. Sprinkle on top of the cheesecake and apples. Cool at room temperature for at least 30 minutes. Then prepare the caramel by heating up for about 30 seconds until pourable. Put the caramel sauce in a frosting bag or a large Ziploc bag. Cut off a small corner and drizzle the caramel sauce on top of the cheesecakes. These look amazing! I may have to eat one or 6! Thanks, Jillian! While making them muffin sized helps with portion control, it’s definitely hard to only eat one! These would be perfect for serving up at a dinner party. Apple and caramel is such a classic autumn combo. I agree, Dannii! This would really be a tasty dinner party dessert! 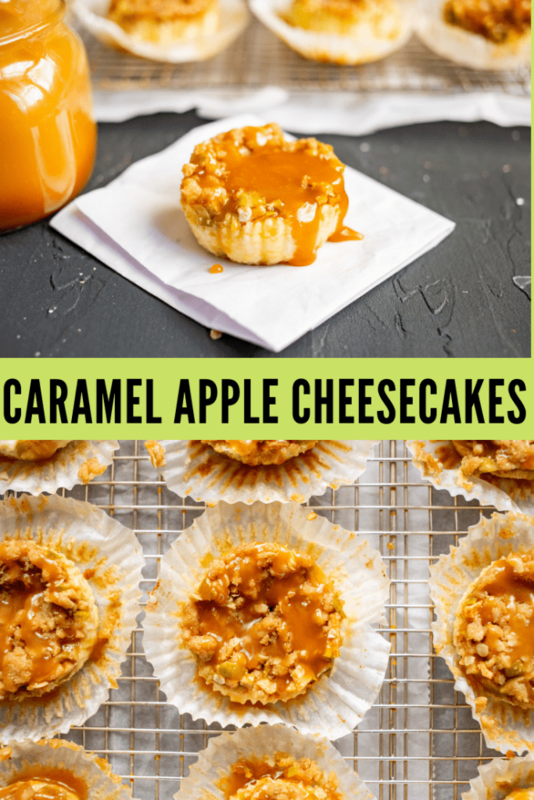 Caramel + apples are just the perfect combo, I’m loving these cheesecakes! Thanks, Andrea! Caramel apples are such a tasty fall combination. 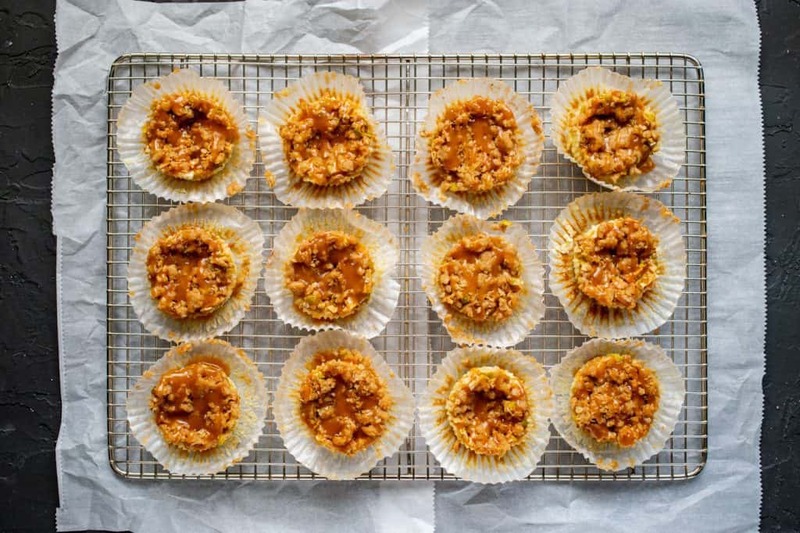 These look like the perfect autumnal dessert – so full of flavour and bitesized treats the whole family would enjoy! Aww, thanks Bintu. Hopefully your family can enjoy them at some point! I’ve been enjoying following your blog for a while! Wow! My taste buds just stood up. What a delicious recipe and in a nice size to handle. Thanks, Ginny! I love mini desserts! Apple cheesecake is such a wonderful dessert option in place of the traditional pumpkin pie, which not everyone eats. These look yummy, especially with caramel! I agree – this would be perfect for any fall dinner, and great as a substitute to pumpkin pie for Thanksgiving! You had me with the title! And thanks for the great tip on getting the batter into those little cups. Awesome idea! Totally pinning these cheesecakes. They look so good! That crumble topping is SO perfect! These are the perfect size too… and of course the caramel sauce is the bomb! Looking forward to making these, thanks! Looks great!!! I definitely would love a couple right now to enjoy with my wine! I’ve always wanted to try and make individual mini cheesecakes, as they’re much easier to serve especially at parties. The flavours sound absolutely amazing, will have to try this. I love the combination of apples and cheesecake! These look so delicious and perfect for Autumn!